Transmission of dengue virus (DENV) requires successful completion of the infection cycle in the Aedes aegypti vector, which is initiated in the midgut tissue after ingestion of an infectious blood meal. While certain Ae. aegypti midgut-associated bacteria influence virus infection, little is known about the midgut-associated fungi (mycobiota), and how its members might influence susceptibility to DENV infection. 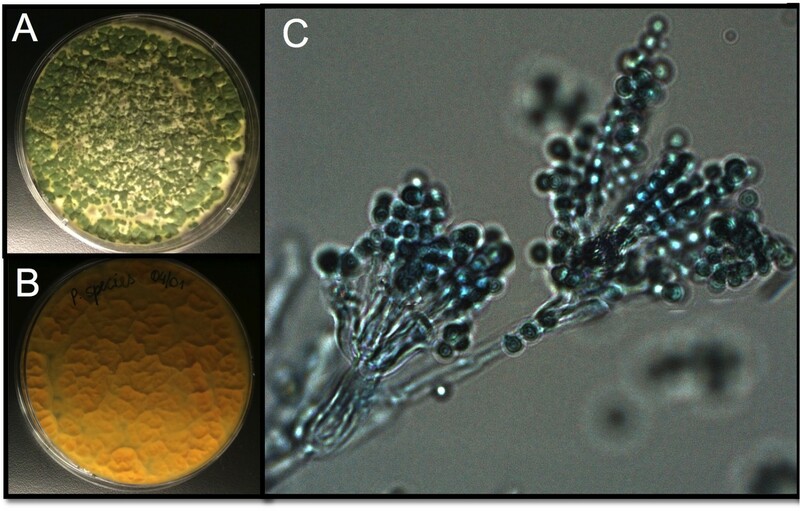 We show that a Talaromyces (Tsp_PR) fungus, isolated from field-caught Ae. aegypti, render the mosquito more permissive to DENV infection. This modulation is attributed to a profound down-regulation of digestive enzyme genes and trypsin activity, upon exposure to Tsp_PR-secreted factors. In conclusion, we show for the first time that a natural mosquito gut-associated fungus can alter Ae. aegypti physiology in a way that facilitates pathogen infection. Arthropod-borne viral diseases have an enormous global public health impact. While dengue virus (DENV) remains the most important arbovirus worldwide, the recent emergence of Chikungunya and Zika virus have exacerbated the impact of Aedes-transmitted diseases. The mosquito Aedes aegypti is the principal vector of DENV. Successful transmission of the virus requires completion of its infection cycle in the mosquito, beginning in the midgut tissue and eventually ending up in the saliva, through which it can be introduced into a new host. The mosquito acquires the virus through a blood meal from an infected vertebrate host. The blood is digested in the insect’s midgut through the enzymatic action of a variety of proteolytic enzymes and provides the necessary nutrients for egg production (Noriega and Wells, 1999). The proteolytic activity of the midgut impairs DENV infection, and specific trypsins are associated with this modulation of susceptibility (Brackney et al., 2008; Molina-Cruz et al., 2005). In the midgut lumen, the virus also encounters a variety of microorganism, which constitutes the vector midgut microbiota. Studies have shown that some bacterial species can inhibit DENV infection and other human pathogens (Bahia et al., 2014; Dennison et al., 2014; Ramirez et al., 2012, 2014). However, the midgut microbiota also comprises fungi, but little is yet known about the mosquito’s mycobiome (Angleró-Rodríguez et al., 2016; da Costa and de Oliveira, 1998; da S Pereira et al., 2009). Most studies have focused on entomopathogenic fungi for use in mosquito control (Dong et al., 2012; Scholte et al., 2007). Fungi are ubiquitous in the environment, especially in tropical regions, and studies have shown the association of filamentous fungi, including Talaromyces species with various vectors of human pathogens (Akhoundi et al., 2012; da Costa and de Oliveira, 1998; da S Pereira et al., 2009; Jaber et al., 2016; Marti et al., 2007). In the present study, we have identified a Talaromyces species fungus from Puerto Rico (Tsp_PR) from the midgut of field-caught Ae. aegypti that renders the mosquitoes more susceptible to DENV infection, through transcriptional and enzymatic inhibition of trypsin enzymes. Adult female Aedes sp. mosquitoes were collected in the dengue endemic Maunabo region of southeastern Puerto Rico. After surface sterilization of mosquitoes, the midguts were dissected and plated on agar for fungal growth. Among the isolated fungi, we identified a Talaromyces species fungus and characterized at the microscopic (Figure 1) and molecular levels. Sequence analysis using the rRNA internal transcribed spacer (ITS) showed a 100% similarity to the fungus Talaromyces species and 99% Penicillium species. Talaromyces is often classified as a Penicillium species classification, since in 2011, species in the Penicillium subgenus Biverticillium were reclassified as Talaromyces (Pitt, 2014). To address the ability of Tsp_PR to colonize the mosquito midgut, we fed mosquitoes on fungus spore-laced sugar solution for 2 days, and then monitored the total fungus colony-forming units (CFUs) in the whole mosquito and midguts for 25 days (Figure 2A,B, Figure 2—source data 1). Tsp_PR was detected in the whole fungus-exposed mosquitoes and midguts during the entire time course. The assay also identified a small number of fungi in the control mosquito cohort but not Tsp_PR. We also investigated whether the presence of the fungus in the mosquito gut had any effect on mosquito longevity. Introduction of the live Tsp_PR spores through sugar feeding for 2 days did not affect mosquito survival up to 38 days (p=0.3073) (Figure 2C, Figure 2—source data 1). After isolation, the fungus was grown on Sabouraud agar and characterized macroscopically and microscopically. (A) Top and (B) bottom view of the fungus on Sabouraud agar. (C) Microscopic view of the typical brush-like biverticillated conidiophore of Talaromyces sp. fungi. Tsp_PR fungus significantly increases DENV infection in Aedes mosquito midguts. Aedes mosquitoes were mock-fed or fed for 48 hr with 10% sucrose solution containing 1 × 109 Tsp_PR spores. After spore feeding, (A) Fungus colonization in whole mosquitoes or (B) midguts. The presence of Tsp_PR in the mosquito was monitored for 25 days after introduction by enumerating fungal CFUs on Sabouraud agar with antibiotics cocktail from three independent experiments, the line indicates the mean and bars the maximum and minimum ranges. (C) Survival assays. Female mosquitoes fed with Tsp_PR spores or unfed were monitored in a daily basis for 38 days in three independent experiments (N = 80, p=0.3073). Error bars represent ± SE. (D) Rockefeller strain mosquitoes, (Control, N = 123; Tsp_PR, N = 120) or (E) Orlando strain mosquitoes (Control, N = 113; Tsp_PR, N = 99) were infected with a blood meal containing DENV; at 7 days post-infection (dpi), the midguts were dissected. Each dot represents a plaque-forming unit (PFU) transformed to log10 in individual midguts from three independent experiments. The line indicates the mean. Upper right boxes show the prevalence of infected mosquitoes, error bars represent the 95% confidence interval. *p<0.05, ***p<0.001,. To investigate whether the presence of Tsp_PR in the mosquito midgut can modulate susceptibility to DENV infection, we introduced whole fungus spores to Ae. aegypti mosquitoes via feeding on a spore-containing sugar solution prior to a DENV-infected blood meal (Figure 2C,D, Figure 2—source data 1). Two mosquito strains were used: the DENV-susceptible Rockefeller strain and the partly resistant Orlando strain (Sim et al., 2013). Seven days after DENV infection, midguts were dissected, and DENV titers were enumerated. Spore ingestion by Rockefeller and Orlando strains females resulted in a significant (p<0.001) increased DENV infection. Upon spore ingestion, both mosquito strains showed an increased DENV infection prevalence, as a measure of the proportion of mosquitoes that were infected, however it was only significantly higher in the Orlando strain. Further studies were performed in the Orlando strain. Talaromyces sp. and related fungi are known to produce a variety of secondary metabolites and proteins (Bara et al., 2013; Klitgaard et al., 2014). It was unclear whether the influence of Tsp_PR on Ae. aegypti’s susceptibility to DENV required the presence of whole live fungi or was mediated by a secreted factor. To distinguish between these two possibilities, we prepared a sucrose suspension of the Tsp_PR secretome containing a filtered fungus culture without spores and mycelia. Mosquitoes were fed on this suspension prior to the ingestion of DENV-infected blood (Figure 3A, Figure 3—source data 1). In a separate experiment, mosquitoes were fed on a sugar solution containing a heat-treated fungus secretome preparation prior to ingestion of DENV-infected blood, in order to address the nature of the factor(s) that influence DENV infection (Figure 3B, Figure 3—source data 1). Mosquitoes that had ingested the fungus secretome-containing solution showed a significantly increased virus infection (p=0.002). In contrast, the heat-treated solution did not enhance DENV infection of the mosquito midgut (p=0.548). Taken together, these findings indicate that Tsp_PR secretes one or more heat-sensitive molecules that enhance DENV infection in Ae. aegypti midguts. Heat-sensitive Tsp_PR secreted molecule(s) render mosquitoes more susceptible to DENV infection. DENV titers by plaque assay. Orlando strain mosquitoes were mock-fed or fed for 48 hr with a 10% sucrose solution a Tsp_PR filtered solution, which contained only (A) the fungus-secreted molecules (Control, N = 68; Tsp_PR, N = 68), or (B) a heat-treated Tsp_PR fungus-secreted molecules (Control, N = 60; Tsp_PR, N = 61). Mosquitoes were infected with a blood meal containing DENV, and midguts were dissected at 7 dpi. Each dot represents a log 10 PFU in individual midguts from three independent experiments. The line indicates the mean. Upper right boxes show the prevalence of infected mosquitoes, error bars represent the 95% confidence interval. **p<0.01. Mosquito are exposed to a variety of fungi in nature. In order to test whether the Tsp_PR-mediated increase of DENV infection is fungus-specific, we performed fungus-exposure and DENV infection assays with a Penicillium chrysogenum that had also been isolated from field-caught mosquitoes. Feeding mosquitoes on whole P. chrysogenum conidia, or culture filtrates, did not affect DENV infection (p=0.829, p=0.867, respectively) (Figure 4A,B, Figure 4—source data 1). We have previously associated P. chrysogenum with an enhancement of Plasmodium infection in Anopheles gambiae (Angleró-Rodríguez et al., 2016). To test whether Tsp_PR could influence malaria parasite infection in its vector we provided Tsp_PR to An. gambiae mosquitoes prior to infection with Plasmodium falciparum, and this resulted in increases parasite oocysts numbers on the mosquito gut (p=0.015) (Figure 4C, Figure 4—source data 1). These results show that Tsp_PR can enhance infection of different human pathogens in different mosquito vectors. Penicillium chrysogenum does not modulate DENV infection in Aedes mosquito midguts, while Tsp_PR render An. gambiae more susceptible to Plasmodium infection. Penicillium chrysogenum was isolated from field-caught Anopheles sp. mosquitoes and re-introduced into Aedes mosquitoes to test the modulation of DENV infection. Aedes Orlando strain was mock-fed or fed for 48 hr with a 10% sucrose solution containing (A) 1 × 109 P. chrysogenum spores (Control, N = 61; P. chrysogenum, N = 47) or (B) fungus-secreted molecules (Control, N = 68; P. chrysogenum, N = 53). After fungus feeding, the mosquitoes were infected with a blood meal containing DENV; at 7 days post-infection (dpi), the midguts were dissected. Each dot represents a PFU value in individual midguts from three independent experiments. The line indicates the mean. (C) Influence of Tsp_PR on P. falciparum infection of An. gambiae, as a measured by oocyst numbers 7 days after feeding on a P. falciparum gametocyte culture (infection intensity). The mosquito cohort (N = 79) that had been exposed to a Tsp_PR -laced sucrose solution for 48 hr prior to parasite infection had a significantly higher P. falciparum infection than did the non-fungus-exposed control cohort (N = 76). Graphs show three independent experiments. Each dot represents a single midgut, and bars represent the mean. *p<0.05. 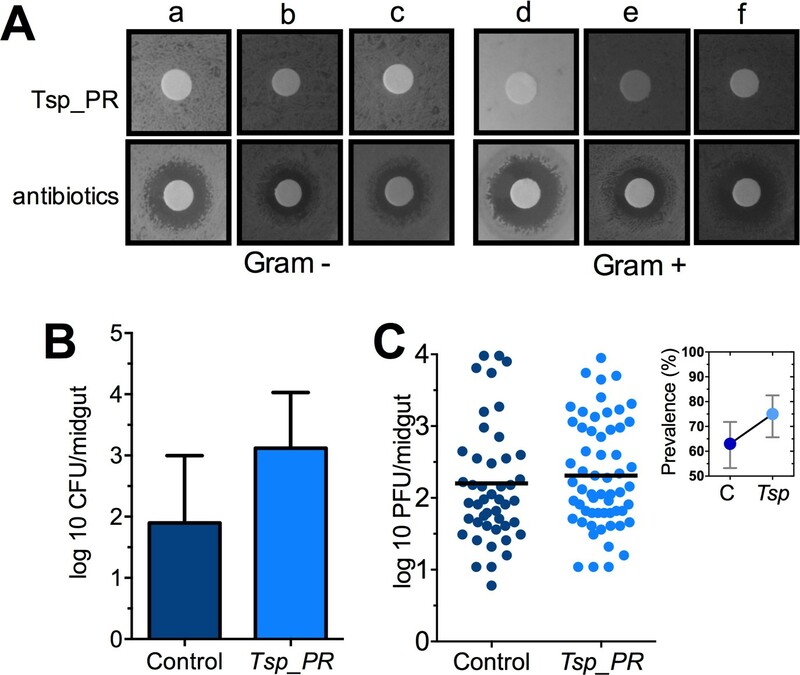 Some species of Tsp_PR and the closely related Penicillium are known to produce bioactive compounds with anti-bacterial activity (Bara et al., 2013; Klitgaard et al., 2014). To investigate whether Tsp_PR produces antibacterial factors, we performed a bacterial growth inhibition assay by a disc diffusion antibiotic sensitivity test (Figure 5A). We examined possible Tsp_PR-mediated growth inhibition of the following bacteria isolated from field-caught mosquito midguts (Ramirez et al., 2012): the three Gram-negative bacteria Serratia marcescens, Chromobacterium haemolyticum, and Enterobacter hormaechei; and the three Gram-positive bacteria Bacillus subtilis, Staphylococcus capprae, and Lactococcus lactis. The disk soaked in the Tsp_PR secretome solution did not show any growth inhibitory activity for any of the six tested bacteria, when compared to an antibiotic control. The Tsp_PR secreted molecule(s) do not affect bacterial load or DENV infection in aseptic mosquitoes. (A) Bacterial growth inhibition assay. Six bacterial isolates of field-caught mosquitoes (Ramirez et al., 2012) were independently plated on LB agar and covered with a disk soaked in a Tsp_PR secretome solution or antibiotic cocktail. Three isolates were Gram-negative bacteria: Serratia marcescens (a), Chromobacterium haemolyticum (b), and Enterobacter hormaeche (c). Three were Gram-positive bacteria: Bacillus subtilis (d), Staphilococcus capprae (e), and Lactococcus lactis (f). Bacterial inhibition was indicated by the presence of a bacterial inhibition zone around the disk. (B) Total bacterial loads. Midguts of secretome solution-exposed and unexposed mosquitoes were collected, homogenized, and plated on LB agar. Bacteria were counted as CFU. Error bars represent ± SD of three independent experiments p=0.202. (C) DENV titers in aseptic mosquitoes. Mosquitoes were treated with an antibiotic cocktail via a sugar meal 4 days before the fungal treatment and were mock-fed or fed for 48 hr on a Tsp_PR secretome solution prior to DENV infection. Each dot represents the PFU after 7 dpi in individual midguts from three independent experiments (Control, N = 75; Tsp_PR, N = 78). The line indicates the mean, p=0.867. Upper right box shows the prevalence of infected mosquitoes, error bars represent the 95% confidence interval. To investigate whether Tsp_PR-secreted molecules can influence the mosquito midgut bacterial load, we quantified the total cultivable bacteria of the midguts of fungus secretome-exposed and non-exposed mosquitoes using CFU assays (Figure 5B, Figure 5—source data 1). 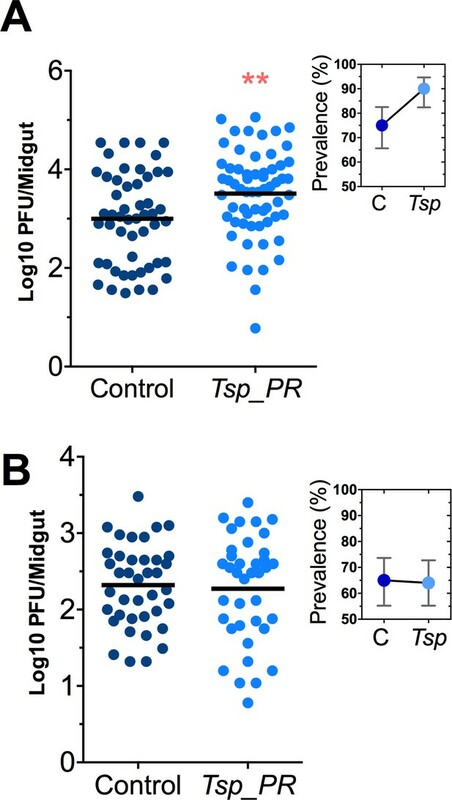 Exposure to the Tsp_PR secretome did not affect the total bacterial midgut load (p=0.147). Previous studies showed that reduction or elimination of the mosquito midgut microbiota, through antibiotic-treatment, (aseptic mosquitoes) significantly increases susceptibility to DENV in Ae. aegypti (Xi et al., 2008). Next, we tested whether the fungus-secretome would influence DENV infection of aseptic mosquitoes (Figure 5C, Figure 5—source data 1). Tsp_PR secretome-fed aseptic mosquitoes did not differ from the aseptic control cohort with regards to DENV infection intensity (p=0.867), while it showed a slightly higher but non-significant, infection prevalence. These data suggest that a bacteria-related factor may in some way influence the fungus-mediated effect on DENV infection. Next we explored the influence of the Tsp_PR secreted factors on the mosquito transcriptome, as a measure of its molecular physiology, in order to provide clues to the mechanism that could be responsible for the influence on DENV infection. A genome-wide microarray-based transcriptome comparison between the midguts of fungus-secretome solution-exposed and non-exposed mosquitoes reveled regulation (23 up-regulated and 22 down-regulated) of a variety of genes belonging to different functional classes (Table 1) (Figure 6A). Forty-eight percent (11 genes) displaying increased transcript abundance after exposure to the Tsp_PR secretome belonged to the redox class and are putatively involved in various oxidoreductive processes, including detoxification. As many as 82% (9 genes) of this redox class encoded cytochrome P450 proteins, suggesting that the fungus activates the detoxification machinery in the mosquito midgut. A significant proportion (55%, 12 genes) of the 22 down-regulated genes were functionally related to blood digestion, and predominantly proteolysis (41%) (Table 1) (Figure 6B). Twenty-two percent of the total down-regulated genes encoded trypsins. These results suggest that the Tsp_PR secretome causes an impairment of the mosquito’s ability to digest the blood meal. Tsp_PR secreted-molecule(s) –induced gene regulation. Functional classification in real numbers of the differentially expressed genes in mosquito midguts treated with Tsp_PR secretome for 48 hr, as compared to those of untreated mosquitoes. The fungus treatment-responsive genes are presented in Table 1 and Supplementary file 1. Significantly regulated genes in Tsp_PR secretome-exposed mosquitoes. Log2 values of differential mRNA abundances (Tsp_PR exposed/non-exposed) of genes. Earlier studies have shown that mosquito ovary development is correlated with the amount of digested blood and reabsorption of nutrients for egg production (Bryant et al., 2010; Lea et al., 1978). Poor digestion of the blood meal therefore results in decreased ovary development. Hence, ovary development after blood feeding can serve as a proxy assay for blood-digestion efficiency. We performed an assay in which Tsp_PR secretome-exposed and subsequently blood-fed mosquitoes were microscopically evaluated for ovary follicle developmental stage after a non-infectious blood meal. Mosquitoes exposed for 48 hr to the fungus secretome prior to blood feeding showed a significantly decreased in ovary development (p=0.025). Only 9% of the mosquitoes had fully developed ovary follicles (Figure 7A, Figure 7—source data 1); in contrast, untreated mosquitoes had a higher level (29%) of fully ovary follicle development. We also, examined the mosquito body weight at 1 hr and 4 hr after a blood meal. Mosquitoes treated with Tsp_PR secretome were heavier than non-treated mosquitoes at 48 hr post-blood meal, indicating impairment of blood digestion (p=0.001) (Figure 7B, Figure 7—source data 1). Inhibition of Ae.aegypti midgut trypsin activity by Tsp_PR-secreted molecule(s). (A) (left) Ovary development based on an arbitrary score of the ovary size at 6 days after a blood meal, 0 for small round follicles, 1 for intermediate size follicles, and 2 for fully developed follicles, with the elongated shape of normal mature eggs. Control, N = 34; Tsp_PR, N = 34, line represents the median, of three independent experiments. (right) Light microscopy picture of (a) a completely developed ovary follicle, which represents a score 2 (b) small round follicles, represent score 0. (B) Change in mosquito body weight after 1 hr (Control, N = 66; Tsp_PR, N = 74), (p=0.784) and 48 hr (Control, N = 58; Tsp_PR, N = 74) (p=0.001) of a non-infected blood meal (C) Trypsin in vivo enzymatic activity in midguts of mosquitoes treated or mock-treated with Tsp_PR secretome. Error bars represent ± SEM of three independent experiments. (D) Trypsin in vitro enzymatic assays of Tsp_PR’s ability to inhibit commercial trypsin activity. The activity was measured at various concentrations of trypsin. Tsp_PR represents the control group in which the fungus filtrate was added but no trypsin, and the absence of trypsin activity was experimentally confirmed (not shown). Error bars represent ± SEM of three independent experiments. *p<0.05, **p<0.01, ***p<0.01. Following blood ingestion, gut epithelial cells synthesize and secrete diverse enzymes to digest the protein-rich meal (Borovsky, 2003). Trypsin activity accounts for most of the proteolytic activity during the mosquito’s digestion of blood (Barillas-Mury et al., 1995; Noriega and Wells, 1999). Our transcriptomic analysis showed a down-regulation of several trypsin genes in fungus-treated mosquitoes in the absence of a blood meal. Next, we performed assays to determine whether the Tsp_PR secretome down-regulates midgut trypsin enzymatic activity in vivo, by simply assaying the enzymatic activity of mosquito guts after exposure to the Tsp_PR secretome at 24 hr after a blood meal. The results showed a significantly lower trypsin enzymatic activity in the midgut of the experimental Tsp_PR secretome-exposed group (p<0.001) than in the non-treated control mosquitoes (Figure 7C, Figure 7—source data 1). The Tsp_PR secretome appeared to stimulate a reduction in trypsin enzymatic activity as a consequence of the transcriptional down-regulation of trypsin genes. However, we also proceeded to test whether the Tsp_PR secretome could directly influence trypsin enzymatic activity in vitro. 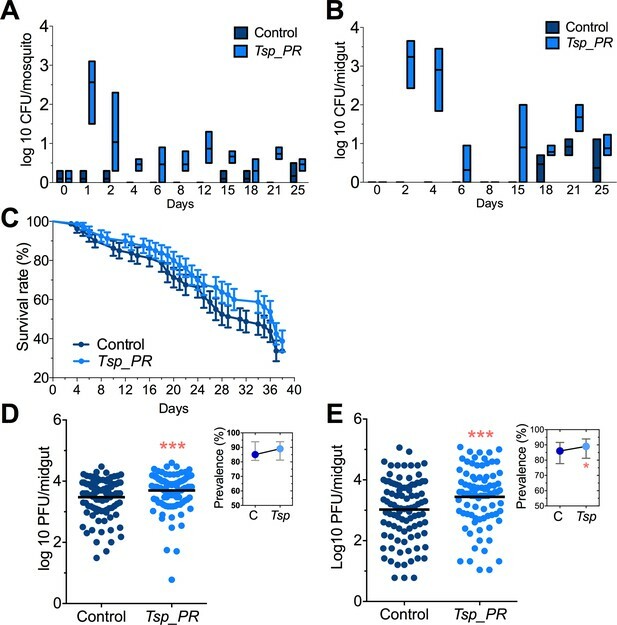 This assay showed that the fungus secretome significantly decreased the in vitro activity of a commercial trypsin (p<0.01) in absence of mosquito’s guts (Figure 7D, Figure 7—source data 1). To provide functional confirmation that the Tsp_PR secretome-regulated trypsins could influence DENV infection, we silenced selected trypsin genes using RNA interference (RNAi)-mediated gene silencing and compared DENV titers to that of a control cohort that has been treated with a GFP dsRNA. Silencing efficiency was evaluated (Figure 8A, Figure 8—source data 1) for AAEL010196, T196 (Figure 8B, Figure 8—source data 1); AAEL013707, T707 (Figure 8C, Figure 8—source data 1); AAEL013714, T714 (Figure 8D, Figure 8—source data 1); AAEL013715, T715 (Figure 8E, Figure 8—source data 1). 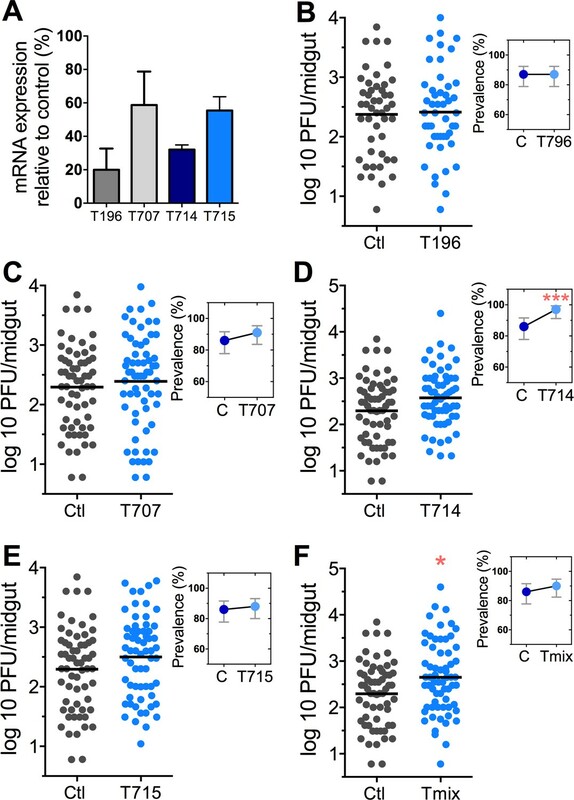 Silencing of T714 and T715 resulted in a modest increased DENV infection intensity, while simultaneous silencing of all trypsin genes (Tmix) significantly increased DENV infection intensity (p<0.05). Silencing of T714 resulted in the greatest increase of DENV infection prevalence (p<0.001) (Figure 8F, Figure 8—source data 1). These results indicate that a transcript reduction of multiple trypsins has a promoting effect on DENV infection, and trypsin T714 appears to exert the strongest contribution. DENV infection after dsRNA-mediated silencing of trypsin genes. (A) Trypsin genes abundance after dsRNA-mediated gene silencing, (AAEL010196 (T196), AAEL013707 (T707), AAEL013714 (T714), AAEL013715 (T715). (B–F) DENV infection intensity of trypsin genes-silenced mosquitoes are compared to GFP dsRNA-treated control mosquitoes (B) T196 (Control, N = 54; T196, N = 54), (C) T707 (Control, N = 71; T707, N = 69), (D) T714 (Control, N = 71; T714, N = 62), (E) T715 (Control, N = 71; T715, N = 72), (F) Simultaneous silencing of all trypsins (Tmix) (Control, N = 71; Tmix, N = 71). The line indicates the mean, each dot represents the log10 PFU after 7 dpi in individual midguts from four independent biological experiments, except T196 which represents three independent experiments. Upper right boxes show the prevalence of infected mosquitoes, error bars represent the 95% confidence interval. *p<0.05, ***p<0.001. Taken together, these results show that one or more Tsp_PR-secreted factors influence blood digestion through the modulation of trypsin expression and activity, which in turn, affects susceptibility to DENV infection. Here we show that a fungus that is naturally associated with Aedes sp. in the field can enhance virus infection, and thereby potentially also enhance DENV transmission. Several studies have shown that the mosquito gut microbiota plays a critical role in determining the outcome of pathogen infection and that different species of gut-associated bacteria can inhibit DENV and Plasmodium infection in Aedes and Anopheles mosquitoes, respectively (Dong et al., 2009; Pumpuni et al., 1996; Ramirez et al., 2012). Studies of the mosquito microbiota have mainly focused on bacteria, whereas the influence of fungi on mosquito physiology and pathogen infection remains largely understudied. Most studies concerning the mosquito mycobiota have explored the biology of entomopathogenic fungi, such as Metarhizium anisopliae and Beauveria bassiana, for use in mosquito control (Darbro et al., 2011; Scholte et al., 2007). The association of diverse fungi, with different developmental stages of mosquitoes in the field is reported (da Costa and de Oliveira, 1998; da S Pereira et al., 2009), and fungi, including Talaromyces sp., have also been isolated from the midgut of other arthropods such as ticks, sandflies, and kissing bugs (Akhoundi et al., 2012; Marti et al., 2007). Their presence is not surprising, since mosquitoes and many other insect vectors of disease are constantly exposed to a fungus-rich environment, including the larval breeding habitat, the plant nectars on which the adults feed, and the sites on which they rest. We have shown that the presence of Tsp_PR spores or fungus secreted-molecules in the midgut tissue of the mosquito results in higher DENV infections in two different Ae. aegypti strains. However, modulation of infection does not seem to be a general property of a closely related Penicillium species, since exposure of Ae. aegypti to whole spores or the secretome of another mosquito-associated species, Penicillium chrysogenum, did not affect DENV infection (Angleró-Rodríguez et al., 2016). Our study suggests that Tsp_PR produces a factor(s) that is a likely a heat-sensitive protein or metabolite that alters the mosquito’s susceptibility to DENV. Mosquitoes treated with the fungus secretome did not display differences in bacterial load in their midguts, indicating that the fungus-secreted factor(s) does not compromise the ability of Ae. aegypti to control its intestinal microbiota. Our transcriptomic analysis of how the Tsp_PR influences mosquito physiology pointed to a profound regulation of genes principally related to metabolism and digestion. Among the top up-regulated genes were ornithine decarboxylase, which is associated with polyamine biosynthesis; glucosyl/glucuronosyl transferases, which play an important role in the detoxification of xenobiotics and the regulation of endobiotics (Ahn et al., 2012); and cytochrome P450, which is involved in detoxification (Strode et al., 2008). Interestingly, a considerable number of up-regulated genes were associated with detoxification, suggesting that the fungus imposes a certain level of toxicity. However, Tsp_PR exposure did not seem to affect mosquito longevity. Perhaps the up-regulation of the detoxification machinery effectively reverses a detrimental effect. Among the up-regulated genes, only glucosyl/glucuronosyl transferase (AAEL003099) modulates DENV infection in Ae. aegypti (Sim et al., 2013). An earlier study showed that this gene was expressed at a lower level in Ae. aegypti strains that are refractory to DENV and at a higher level in DENV-susceptible strains, suggesting that the AAEL003099 gene acts as a DENV host factor. These findings are in agreement with our study, in which Tsp_PR secretome-exposed mosquitoes showed an elevated expression of AAEL003099. It is therefore possible that a Tsp_PR-mediated up-regulation of AAEL003099 contributes to the elevated DENV infection levels. Another up-regulated gene associated with proviral effect is ornithine decarboxylase, a recent study showed that the polyamine biosynthesis is associated with an enhanced infection of Chikungunya and Zika viruses in humans (Mounce et al., 2016). The most striking expression signature that resulted from Tsp_PR secretome exposure was a profound overrepresentation of down-regulated proteolysis genes. Trypsin genes were highly represented in this category, and they play a crucial role in the blood-digesting process in the mosquito midgut. Two groups of trypsins are produced after the blood meal: early trypsins during the first 6 hr post-blood meal, and the late trypsins between 8 and 36 hr post-blood meal (Barillas-Mury et al., 1995; Noriega and Wells, 1999). However, the early trypsin mRNA is produced prior to feeding and is stored in the midgut epithelial cells, remaining untranslated until blood ingestion (Noriega and Wells, 1999). Our transcriptomic analysis revealed trypsin AAEL010196 to be the most down-regulated, followed by four other trypsin genes (AAEL013714, AAEL010203, AAEL013715, and AAEL013707). We confirmed the functional significance of trypsin transcript depletion on DENV infection using RNAi-mediated gene knock-down studies. A phylogenetic analysis based on the trypsin gene nucleotide sequences revealed that the AAEL013715 and AAEL013707 cluster together and show a closer resemblance to the early trypsin EA1 gene, which has been associated with Aedes blood digestion (Figure 9). The trypsin genes AAEL013714, AAEL010203, and AAEL010196 have a close resemblance to two well-characterized late trypsins, 5G1 and LT (Brackney et al., 2010). Studies of trypsin 5G1 have established a link between trypsin activity and permissiveness to DENV infection, since RNAi-mediated repression of this gene results in greater susceptibility to the virus (da Costa and de Oliveira, 1998). This finding agrees with our studies showing that silencing of a closely related trypsin, the AAEL013714, also results in a greater susceptibility to DENV infection. QTL mapping of loci that determine permissiveness to DENV also indicated the likely involvement of trypsin genes (Bosio et al., 2000). Phylogenetic tree of the nucleotide alignment of trypsins regulated by Tsp_PR and others associated with the Aedes midgut. Branch support values represent approximate likelihood ratios, constructed using the program PhyML 3.0 approximate likelihood-ratio test (Dereeper et al., 2008). We have recently demonstrated that heat-stable factors secreted by a mosquito-associated P. chrysogenum fungus can render Anopheles gambiae mosquitoes more susceptible to the malaria parasite Plasmodium when present in the midgut tissue (Angleró-Rodríguez et al., 2016). We showed that this phenomenon was attributed to the up-regulation of an ornithine decarboxylase gene which in turn results in a suppression of nitric oxide –dependent parasite killing. While ingestion of Tsp_PR also resulted in a strong up-regulation of the Ae. aegypti ornithine decarboxylase gene, heat inactivation of its secreted factors abolished its ability to modulate DENV infection. Exposure of An. gambiae to Tsp_PR also rendered it more permissive to Plasmodium infection, but exposure of Ae aegypti to P. chrysogenum did not affect its permissiveness to DENV. Finally, exposure of An. gambiae to P. chrysogenum did not result in a down-regulation of blood digestive enzymes (Angleró-Rodríguez et al., 2016). These results indicate that that the two fungi influence infection with the virus and the parasite through different factors and mechanisms in their respective mosquito vectors. While both Tsp_PR and P. chrysogenum appears to secrete a factor that influences An. gambiae susceptibility to the malaria parasite, only Tsp_PR produces the factor that render Ae. aegypti more susceptible to DENV. Our findings may have significant implications for the epidemiology and transmission of DENV by Aedes mosquitoes in the field. Fungi are abundantly associated with field mosquitoes (da Costa and de Oliveira, 1998; da S Pereira et al., 2009; Marti et al., 2007); our studies show that mosquitoes can acquire Talaromyces sp. fungus through sugar feeding and that it will successfully colonize the mosquito midgut for at least 25 days. Whether the exposure of mosquitoes to Tsp_PR in the field results in a greater permissiveness to DENV is unknown and difficult to assess, but greater permissiveness is most likely dependent on the intensity of the fungal exposure and the success of the fungus in persisting in the gut of various mosquito populations. A greater susceptibility of mosquitoes to DENV as a result of Tsp_PR exposure could translate into an enhanced transmission. However, this possibility remains to be addressed experimentally, perhaps by correlating the presence of Tsp_PR and DENV in field-caught mosquitoes in dengue-endemic areas. The observed impact of Tsp_PR on mosquito egg development in the ovary and the delayed degradation of the blood meal may suggest that exposure of mosquitoes to the amounts of the Tsp_PR secretome used in this study would impose a fitness cost. In summary, we show how the mosquito mycobiota can influence Ae. aegypti vector competence for DENV by physiologically modulating midgut enzymes, one of the first barriers the pathogen encounters during infection (Figure 10). Our study represents a significant step toward the understanding of fungi-mosquito interactions and their possible implications for the transmission of DENV and perhaps other arboviruses. Model of Tsp_PR-mediated increased Ae. aegypti permissiveness to DENV. Tsp_PR secreted factors render Ae. aegypti more permissive to DENV through a mechanism that involves the down-regulation of gut trypsin transcripts and inhibition of enzymatic activity in the midgut epithelium. Trypsins have an antagonistic role in DENV infection. Decrease of trypsins abundance results in increased susceptible to DENV infection. Additional files. This study was carried out in strict accordance with the recommendations in the Guide for the Care and Use of Laboratory Animals of the National Institutes of Health and the Animal Care and Use Committee of the Johns Hopkins University (Permit Number: M006H300). Mice were only used for mosquito rearing as a blood source, according to approved protocol. Commercial anonymous human blood was used for DENV infection assays in mosquitoes, and informed consent was therefore not applicable. The Johns Hopkins School of Public Health Ethics Committee approved this protocol. The Ae. albopictus cell line C6/36 (ATCC CRL-1660) was maintained in MEM (Gibco) supplemented with 10% FBS, 1% L-glutamine, 1% non-essential amino acids, and 1% penicillin/streptomycin. Baby hamster kidney cells (BHK-21, ATCC CCL-10) were maintained on DMEM (Gibco) supplemented with 10% FBS, 1% L-glutamine, 1% penicillin/streptomycin, and 5 µg/mL plasmocin (Invivogen, San Diego, CA). C6/36 cells and BHK-21 cells were incubated in 5% CO2 at 32°C and 37°C, respectively. Ae. aegypti mosquitoes were maintained on a 10% sucrose solution at 27°C and 80% relative humidity with a 14:10 hr light:dark cycle. Tsp_PR was grown on Sabouraud glucose agar (SGA) and identified as described in (Angleró-Rodríguez et al., 2016); spores were collected in PBS, counted, and resuspended in a 10% sucrose solution containing 1 × 109 spores. For fungal filtrate, spores were collected in a 10% sucrose solution and kept in a rocker machine overnight at 4°C. The next day, the solution was centrifuged at 470 rcf to collect the supernatant, which was passed through a 0.2-micron filter to remove fungus mycelia and spores. The heat-inactivated filtrate was treated in the same way, but the supernatant was incubated for 2 hr at 95°C. Adult female Ae. aegypti (3–4 days old) were starved for 6 hr and fed with the appropriate fungal treatment for 48 hr. DENV2 strain New Guinea C (NGC) was propagated in C6/36 cells, and titers were determined on BHK-21 cells by plaque assay. Mosquito infections with DENV were carried out as previously described (Das et al., 2007). In brief, DENV2-NGC was propagated in C6/36 cells for 6 days. Virus suspension was mixed 1:1 with commercial human blood and supplemented with 10% human serum and 100 µM ATP. Mosquitoes were infected via an artificial membrane feeder at 37°C for 30 min. Midguts were dissected and individually collected at 7 days post-infection. Plasmodium falciparum infections were performed following a standard protocol (Dong et al., 2006). At 48 hr post-feeding on fungi or filtrate, mosquitoes were fed on an NF54W strain gametocyte culture mixed with human blood, through a membrane feeder at 37°C. Engorged mosquitoes were maintained at 27°C for up to 8 days. P. falciparum-infected mosquito midguts were dissected and stained with 0.1% mercurochrome, and oocyst numbers were determined using a light microscope. BHK-21 cells were seeded in 24-well plates the day before the assay. The next day, individual midguts were homogenized in DMEM with 0.5 mm glass beads using a Bullet Blender (NextAdvance). Homogenates were centrifuged at 18,400 rcf and the virus-containing suspensions were 10-fold serially diluted, and 100 uL of each dilution were inoculated onto 80% confluent BHK-21 plates. Plates were rocked for 15 min at room temperature and then incubated for 45 min at 37°C and 5% CO2. After the incubation, 1 mL of DMEM containing 2% FBS and 0.8% methylcellulose was added to each well, and plates were incubated for 5 days. Plates were fixed and stained for 30 min with a 1:1 methanol/acetone and 1% crystal violet mixture. Then, plates were washed with water and the plaque-forming units counted. Mosquitoes were surfaced-sterilized for 1 min in 70% ethanol and rinsed twice with 1X PBS. Mosquitoes were dissected, and five midguts were pooled in a microcentrifuge tube containing 150 µl of sterile PBS. Midguts were homogenized with a pestle and plated on LB agar for bacterial enumeration or Sabouraud agar with an antibiotic cocktail of penicillin/streptomycin and gentamicin for fungal enumeration (whole mosquitoes or midguts were collected for this procedure). Plates were incubated at room temperature for 48 hr for bacteria and 4 days for fungus, and then plates were counted as colony-forming units (CFU). Bacterial growth inhibition assay. Was performed using a disc diffusion test, in which a sterile filter paper disk soaked in a fungus secretome solution or an antibiotic cocktail as a control, was placed over a bacterial culture on LB agar medium. Plates were incubated for 24 hr at 32°C and the inhibition zone were evaluated. Adult female mosquitoes were maintained on 10% sucrose solution containing 75 μg/mL gentamicin sulfate and 100 units (μg)/mL of penicillin-streptomycin. Treatment was carried out for 4 days. To validate the efficiency of antibiotic treatment, midguts from control untreated and antibiotic treated mosquitoes were subjected to CFU assays. Mosquitoes were treated with the bacteria-free fungus secretome for 2 days, and then maintained on antibiotic-treated sucrose after the DENV infection. Transcriptome assays were conducted and analyzed as reported previously with a custom-designed full genome Ae. aegypti Agilent-based microarray platform (Sim et al., 2013; Xi et al., 2008). In brief, 200 ng of total RNA per replicate was used to synthesize Cy3 or Cy5-labeled cRNA probes using a Low Input Quick Amp Labeling kit (Agilent Technologies). Probes from midguts of Tsp_PR-treated mosquitoes were individually hybridized against probes from untreated mosquitoes as a control. The arrays were scanned with an Agilent Scanner. Transcription data were processed by beginning with background subtraction of the median fluorescent values, normalized with the LOWESS normalization method. Cy5/Cy3 ratios from replicate assays were subjected to t-tests at a significance level of p<0.05 using TIGR MIDAS and MeV software. Transcript abundance data from all replicate assays were averaged with the GEPAS microarray preprocessing software and transformed to a logarithm (base 2). Self-self hybridizations have previously been used to determine a cutoff value for the significance of gene regulation on these microarrays of 0.75 in log2 scale (Yang et al., 2002). Three independent experiments were performed. Numeric microarray gene expression data are presented in Table 1, Supplementary file 1. Mosquitoes we exposed or not exposed to the Tsp_PR secretome for 48 hr, after they had received a blood meal. Fully engorged females from both groups were collected and maintained for 6 days; their ovaries were then dissected in PBS, and oogenesis was microscopically evaluated. Through microscopic evaluation of the follicle development in the ovary, we assigned an arbitrary score of 0 for small round follicles, 1 for intermediate size follicles, and 2 for fully developed follicles, with the elongated shape of normal mature eggs. Mosquitoes were fed with non-infectious blood for 20 min, then fully-engorged mosquitoes were individually collected and placed in individual round-bottom conical tubes and incubated without sugar or water. The conical tube weight was measured prior to collecting the mosquito. The weight of mosquitoes at 1 hr post-infection was calculated by subtracting the empty tube weight from the total weight. At 48 hr mosquitoes were cold anesthetized and weighted directly to the analytical balance without the tube to avoid accumulated excreta. Mosquitoes were exposed, or not exposed, to the Tsp_PR secretome for 48 hr, after they were fed an artificial blood meal (40% PBS, 50% FBS, 1 mM ATP, and 2 mg of phenol red) to avoid interference with the assay (Brackney et al., 2008). At 24 hr post-blood meal, 10 midguts per group were dissected, collected in 50 µL of buffer solution (50 mM Tris-HCl, pH 8.0, with 10 mM CaCl2), and homogenized on ice with a pestle. Supernatants were collected after a high-speed centrifugation (18,400 rcf) at 4°C. Trypsin activity assays were performed using the synthetic colorimetric substrate Nα-benzoyl-D,L-arginine-p-nitroanilide hydrochloride (BApNA) (Sigma). The reaction mixtures, each containing 5 μl of midgut extract and 1 mM BApNA, were then incubated at 37°C for 5 min. Absorbance values were measured in a plate reader at A405 nm. A reaction mixture was made using equal volumes of Tsp_PR filtrate and commercial trypsin (105 µM) (Gibco). The mixture was incubated at 27°C for 3 hr. The reaction solution was prepared by adding increasing volumes of the 1:1 mixture to the buffer solution and 1 mM BApNA, to a final volume of 200 uL. Absorbance was measured as described above. The trypsin genes were depleted from adult female mosquitoes using established RNA interference (RNAi) methodology (Sim et al., 2013). Mosquitoes injected with GFP dsRNA were used as a control and RNAi assays were repeated three times. Gene silencing was verified by qRT-PCR at 3 days post-injection using RNA extracted from five whole mosquitoes per independent experiment. The primers to produce PCR Amplicons for dsRNA synthesis and qRT-PCR are presented in Supplementary file 2. Mosquito samples were collected in RLT buffer (QIAGEN), and then stored at −80°C until extraction. Total RNA was extracted using the RNeasy Mini Kit (QIAGEN); samples were treated with Turbo DNase (Ambion) before reverse transcription with a MMLV Reverse Transcriptase kit (Promega) according to the manufacturer’s instructions. The cDNA was then used to determine gene expression by quantitative PCR using SYBR Green PCR Master Mix (Applied Biosystem). The transcript abundance of trypsin was compared to the expression of the ribosomal protein gene S7 as a normalization control. qPCR primers were designed to amplify the mRNA transcript outside the dsRNA region. However, groups where trypsins were silenced simultaneously the qPCR primers for a given trypsin crossed detected the injected dsRNA of other highly similar trypsins making unable the evaluation of silencing efficiency. To compare DENV titers between groups, P-values were calculated using Generalized Linear Regression (GLM) with experiment-clustered robust variance estimates to account for potential within-experiment correlation of outcomes (Rogers, 1993). The models included different link functions for various outcomes: identity link was used to compare DENV PFU and bacteria CFU, log-link with Poisson distribution was used for modeling infections and score 0 to 2 for oogenesis assays and log-link with Negative Binomial distribution was used to model number of Plasmodium falciparum oocysts. The models included an indicator variable for treatment with only two levels or multiple indicator variables for multiple treatment groups. Wald test P-values are reported in the results. Survival was analyzed using the Log-rank (Mantel-Cox) test in Graphpad Prism. See source data file for the summary of the statistics. Insect Biochemistry and Molecular Biology 42:133–147. Journal of Medicinal Chemistry 56:3257–3272. Insect Biochemistry and Molecular Biology 25:241–246. The American Journal of Tropical Medicine and Hygiene 79:267–274. Journal of Insect Physiology 56:736–744. Journal of Basic Microbiology 38:343–347. Biocontrol Science and Technology 21:1027–1047. Journal of Visualized Experiments, 220, 10.3791/220. Current Opinion in Insect Science 3:6–13. Insect Biochemistry and Molecular Biology 42:126–132. Analytical and Bioanalytical Chemistry 406:1933–1943. Boletín De La Sociedad Argentina De Botánica 42:175–179. The American Journal of Tropical Medicine and Hygiene 72:631–637. Cell Host & Microbe 20:167–177. Journal of Insect Physiology 45:613–620. 6–7, Penicillium and Talaromyces: Introduction, Encyclopedia of Food Microbiology. The American Journal of Tropical Medicine and Hygiene 54:214–218. PLoS Neglected Tropical Diseases 6:e1561. PLoS Neglected Tropical Diseases 7:e2295. Insect Biochemistry and Molecular Biology 38:113–123. Thank you for submitting your work entitled "An Aedes aegypti-associated fungus increases susceptibility to dengue virus by modulating gut digestive activity" for consideration by eLife. Your article has been reviewed by three peer reviewers, and the evaluation has been overseen by a Reviewing Editor and a Senior Editor. The following individuals involved in review of your submission have agreed to reveal their identity: Guido Favia (Reviewer #1); Louis Lambrechts (Reviewer #3). Our decision has been reached after consultation between the reviewers. Based on these discussions and the individual reviews below, we regret to inform you that your work will not be considered in its current form for publication in eLife. The reviewers concur that the work presented has the potential to provide an interesting advancement of knowledge in the relationships between components of the midgut-associated fungi and mosquito's vector capacity. However the study is preliminary in several respects and fails to provide evidence that gut digestive activity modulates dengue susceptibility. Additional experiments are required to establish a direct and functional link between DENV susceptibility and trypsin activity. Two of the reviewers also raised serious concerns about the inappropriate statistical methods used to analysis of data and evaluate significance of the results. Moreover the raw data must be included to meet the standards in data reporting. Despite being generally positive about the nature of this study the identified weaknesses will take some time to address (likely more than 2 months). While we are rejecting the paper as a result of this, I am broadly supportive of this manuscript and if you feel that you are able to address these issues we will consider a newly submitted form of this paper that will be treated as a revised manuscript. Rarely I have enjoyed so much to review a manuscript. This one deals with a very interesting subject and targeting the mycobiota component of mosquito vector is very original since most of the work performed up to now has been mainly targeted to bacteria and viruses. The findings are relevant and supported by rigorous and coherent methodological approach. The Introduction describes the status of the field well, the results are overall well-presented, and the discussion is well-organized and thoughtful. Materials and methods are well described allowing others to replicate the work. Figures, tables and Supplementary Information are well designed and all reader to easily catch the essence of the results and their intrinsic originality. The Bibliography is complete, providing references in an adequate number. The authors addressed all the questions the work was raising (especially Tsp_PR secretome mediate the enhancement of DENV infection through a bacteria-independent mechanism). Ultimately, it is a really nice piece of science. The manuscript describes laboratory experiments that interrogate the impact of a Talaromyces fungus on Aedes aegypti susceptibility to dengue virus. Regretfully, in its current form, the manuscript is too preliminary for publication in eLife. The title of the manuscript is mis-leading as there is no evidence that gut digestive activity modulates dengue susceptibility. The problem is that the authors used two unrelated systems to address their question; they first fed mosquitoes with fungal spores to examine the effect on dengue susceptibility in the midgut, fungal persistence throughout the duration of the experiment for mosquito survival assays. However, the rest of the manuscript is based on fungal secretome. This is like comparing apples and oranges. There is no evidence that spores develop further or persist as spores in the mosquito midgut. There is no evidence that the spores persist in the midgut as the experiments have been performed with whole mosquitoes. 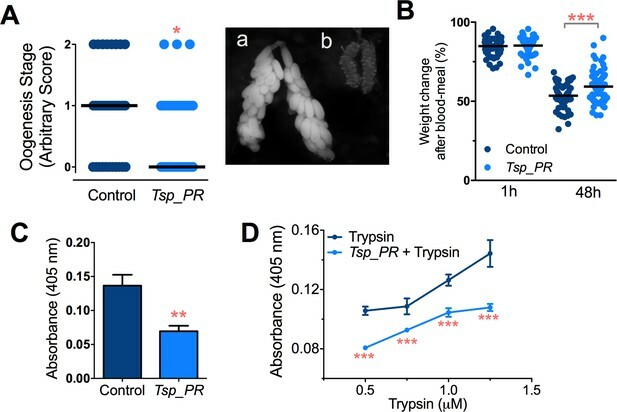 Even should the assumption that spores develop as actively as on the fungal medium and secrete all factors, there is no direct evidence that trypsin inhibition underlies the observed susceptibility, there is no functional analyses of the causative effect of trypsin genes or trypsin activity. Finally, as described below, the authors do not use appropriate statistical methods to evaluate the significance of their results, and they do not provide their raw data for confirmation. This experimental study provides evidence that a naturally occurring fungus isolated from the midgut of field-caught Aedes aegypti specimens can influence DENV infection and blood digestion in the midgut of mosquitoes previously exposed to fungal spores or fungus-secreted molecules. Overall, the paper is well structured and concisely written. The main issue is the lack of direct evidence to link the anti-DENV effect and the digestion-disrupting effect of the fungus. Although the paper is entitled "An Aedes aegypti-associated fungus increases susceptibility to dengue virus by modulating gut digestive activity", the data only show that Tsp_PR (1) increases DENV titer in the Aedes aegypti midgut and (2) inhibits transcription and activity of blood-digesting enzymes. Whether (1) and (2) are related remains to be conclusively demonstrated. The causative link implied by the paper as it currently stands could be misleading. Thank you for submitting your article "An Aedes aegypti-associated fungus increases susceptibility to dengue virus by modulating gut trypsin activity" for consideration by eLife. Your article has been reviewed by four peer reviewers, and the evaluation has been overseen by a Reviewing Editor and Wendy Garrett as the Senior Editor. The following individuals involved in review of your submission have agreed to reveal their identity: Sassan Asgari (Reviewer #1); Fernando Noriega (Reviewer #3). Overall the quality of the paper is compromised unless the conclusions are revised based on a more rigorous analysis and presentation of the data. In this study Anglero-Rodriguez et al. present evidence that a fungus originally isolated from wild Aedes aegypti mosquitoes can affect dengue virus infection and digestive processes when introduced into the midgut. This effect is credited to a down-regulation of genes involved in blood digestion, resulting in a decrease of trypsin activity, impaired digestion and diminished oogenesis. Apparently, trypsin also represses microbiota proliferation, as flies treated with the Tsp_PR secretome also harbor about 2x the density of bacteria in their gut. The results, although mostly correlative, are significant. The molecular bases of the fungus effect are not explored in detail, but the study is s still comprehensive and might in part explain why certain populations of Ae. aegypti are more prolific vectors of dengue than are others. One of the main criticisms of the previous version of the manuscript was that the study did not conclusively link the anti-dengue effect with the disruption of blood digestion. In the revised manuscript, the authors claim that this functional link is now demonstrated by additional data shown in Figures 7D-F. Throughout the paper there are statistical issues with the use of ANOVA to analyze virus titers (log PFU/midgut). These analyses include virus-negative mosquitoes and this has two undesirable consequences. First, the residuals of the analysis are typically not normally distributed, which violates one of the fundamental assumptions of ANOVA. Second, the analysis of infection intensity is partially redundant with that of prevalence because it includes the effect of infection status (infected or uninfected). Figures 2A and B, 3A and B, 5C, 7F. The upper right infection prevalence boxes were not statistically analyzed (or the stats aren't shown) to indicate if a significant difference was observed. Thus, the authors can't technically state that they observed an increase in infection prevalence (e.g., for Figures 2A and B, second paragraph of the Results section). Figure 7A. Ovary development is a tangential parameter for quantifying blood meal digestion. Other factors could contribute to the reduced ovary size observed in Tsp_PR secretome treated mosquitoes. For example, Tsp_PR secretome treated mosquitoes house significantly more bacteria in their gut, and this population may include taxa not normally present. This could induce an immune response. The reduced ovary development observed under these circumstances could reflect a competition for resources between the bacteria and the mosquito. A more direct measurement of blood meal digestion is to simply weight the gut (as in Emre Aksoy et al. 2016, PNAS) or better yet, take photos (as in Bryant et al., 2010). Figure 7E the authors use ANOVA to compare log-transformed virus titers per mosquito, across several trypsin knockdown treatments. They include virus-negative mosquitoes in their analysis, which results in the shortcomings mentioned above. When one performs the ANOVA of virus titers without virus-negative mosquitoes, for T714 and Tmix (the treatments with the strongest effect according to the authors) the residuals meet the normality assumption of ANOVA and there is a statistically significant interaction between experiment and treatment. In fact, the treatment effect is only seen for the first experiment, but not for the other two experiments. This means that the effect is inconsistent and seriously questions the validity of the conclusion. Figure 7F the authors analyze infection prevalence across several trypsin knockdown treatments. In the Results section the authors claim "silencing of T714 resulted in the greatest increase of DENV infection prevalence". This sentence together with the blow-up view of infection percentages (without plotted confidence intervals) in Figure 7F are strongly misleading. Even for T714 there is no statistically significant effect of the treatment on infection prevalence. We don’t agree with the apples and oranges metaphor used by the reviewer; apples and apple juice would have been more accurate. The first observation of the study was that feeding on live fungi resulted in an enhanced DENV infection, next we show that the effect on infection is attributed to fungus secreted factors. Fungi are generally known for their production and secretion of a variety of bioactive secondary metabolites. We proceeded with the remaining experiments using the fungus secretome because it contains the bioactivity of interest and represented a less complex sample than the entire organism, and the effect was stronger (P <0.0001). The probability that the effect on DENV infection exerted by the spores/conidia (which we have shown secreted the bioactive molecule(s) which we call “secretome”) when present the midgut is attributed to something different from that contained in the filtered spore/conidia culture (secretome) is so small, and difficult to address, that we don’t think it deserved further speculation. We have addressed the other concerns regarding spores persistence in the midgut by performing a new set of experiments where fungus persistence up to 25 days after ingestion was monitored. We now show the persistence of the conidia in the mosquito midgut, after a single feeding on conidia, throughout the entire time-course. Regarding the title of the manuscript; we have now provided functional evidence, through genesilencing assays, linking decreased trypsin transcript abundance to enhanced DENV infection (Figure 7D, 7E, 7F). In the original manuscript we presented functional assays showing that midguts treated with the fungus secretome display a significantly lower trypsin enzymatic activity (now Figure 7B). However, to further address the reviewer’s concern, we have now provided functional evidence, through gene-silencing assays, linking decreased trypsin transcript abundance to enhanced DENV infection (Figure 7D, 7E, 7F). We have provided a detailed raw data file outlining the statistical analyses. In the first revision, we did not claim that the anti-dengue effect is linked with the disruption of blood digestion, but with a disruption of trypsin activity. We explained the reduced ovary development as a possible result of impaired blood digestion. We clarify this aspect in the revised manuscript, and included additional data as suggested by the reviewer, showing that mosquitoes treated with fungus secretome weight more than untreated mosquitoes at 48h post-blood meal (now Figure 7B). We eliminated virus-negative mosquitoes from the intensity graphs and only include this information in graphs showing infection prevalence. We sought specialist advice on statistical analyses from the Johns Hopkins School of Public Health Biostatistics department, and they analyzed the data using Generalized Linear Regression (GLM) with experiment-clustered robust variance estimates to account for potential within-experiment correlation of outcomes (Rogers, 1993) see Statistical Analysis in the Materials and methods section for more details. We performed statistical analysis of the prevalence data, and include this information in the revised manuscript. Ovary development is part of the gonotrophic cycle after a mosquito takes a blood meal, and impairment of ovary development can indicate compromised blood digestion or nutrient acquisition (Bryant et al., 2010; Lea et al., 1978). However, as suggested by the reviewer, and used by others (Pimenta de Oliveira et al., 2017), we now present new data on mosquito body weight after blood feeding, showing that mosquitoes treated with fungus secretome are heavier than the non-treated at 48h post-blood meal suggesting a compromised blood degradation process (Figure 7B). We eliminated the virus-negative mosquitoes for all graphs and only included this information in the prevalence graphs. We also included a 4th independent experiment to the data set to render it more robust. Data was analyzed using Generalized Linear Regression (GLM) with experiment-clustered robust variance estimates to account for potential within-experiment correlation of outcomes (Rogers, 1993) see Statistical Analysis in the Materials and methods section for more details. For clarity, we decided to show each trypsin silencing graph in an individual panel with its respective prevalence value and confidence intervals error bars. We would like to thank the Johns Hopkins Malaria Research Institute Insectary and the Microarray Core Facilities. We also thank Dr. Deborah McClellan for editing the manuscript. We thank for the support with the statistical analysis from the National Center for Research Resources and the National Center for Advancing Translational Sciences (NCATS) of the National Institutes of Health through Grant Number 1UL1TR001079. This work has been supported by National Institutes of Health, National Institute of Allergy and Infectious Diseases grant R01AI101431. We thank the Bloomberg Philanthropies for their support. Animal experimentation: This study was carried out in strict accordance with the recommendations in the Guide for the Care and Use of Laboratory Animals of the National Institutes of Health and the Animal Care and Use Committee of the Johns Hopkins University (Permit Number: M006H300). Mice were only used for mosquito rearing as a blood source, according to approved protocol. © 2017, Angleró-Rodríguez et al.